Please visit Tourism Vancouver for a list of the venues and sites that you could experience in and around Vancouver. Questions concerning accommodations? Contact Dr. Karen Kavanagh, SFU at kavanagh@sfu.ca. 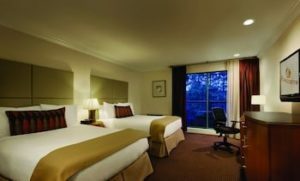 To request accommodations at the SFU Burnaby Campus, click: http://bit.ly/bookSFU and select CAP Congress 2019 (Jun/01/2019 to Jun/07/2019) from the drop-down menu. The special rates and room blocks outlined below for CAP Congress attendees will be available until May 1, 2019. After this date, availability cannot be guaranteed and guests will be subject to regular high season rates. Traditional residence style housing is perfect for travelers on a budget, teams, groups or visitors looking for an on-campus housing alternative. Rooms are single occupancy with bed linens, towels and shared bathrooms. Each room is furnished with an extra-long (78 inch) single bed, a dresser, a built-in desk, a task chair, bookshelves, a small fridge, closet and Wi-Fi Internet Access. There are universally-accessible sleeping rooms and bathrooms located on each floor. A community lounge located on each floor is an ideal place for a casual meeting space for groups or a place to relax with friends. Each lounge comes with a TV, microwave and Wi-Fi Internet Access. Laundry facilities are located in each building. Please note: There is no air conditioning in the private residence rooms. There is a very limited number of accessible private residence rooms. Rates include linen and towel service every third day and wireless internet service. Guest rooms do not include parking and are subject to applicable taxes. In a quiet location on the west end of campus the three-level townhouses are ideal for families. The townhouse buildings offer guests their own self-contained “home away from home”. Each unit has two full washrooms and furnished living rooms. Kitchens are equipped with toaster, kettle, stove, fridge and table for four. The townhouse units have four individual locking bedrooms that include a single bed, bookcase, desk, chair, and Wi-Fi Internet Access. Modern laundry rooms for guest use are located throughout the townhouse complex. Please note: There is no air conditioning in the Townhouses. The townhouse units have a 2 night booking minimum. If you are requesting to reserve a Townhouse Unit, please only submit one reservation request per Townhouse Unit (e.g. not multiple requests for a single unit) and indicate in the comment box the names of the guests staying in the unit. The Townhouse units are not accessible. 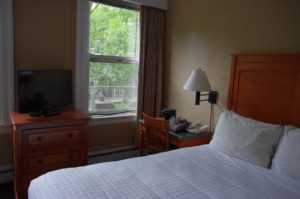 Rates include linen and towel service every third day and wireless internet service. Guest rooms do not include parking and are subject to applicable taxes. Blocks of rooms at various locations near Simon Fraser University have been reserved for the duration of Congress. Special CAP Congress rates are available until April 17th ONLY. Please see the following table for full details. Prices are indicated in CAN$, before all applicable taxes. Note: block booking rates for the Executive Suites and Executive Plaza hotels will only be held until April 17, 2019. After that, regular rates will apply. We encourage to you book early to ensure availability. *15% additional tax will apply. Individual reservations require credit card to guarantee and must be cancelled at least 14 days prior to arrival to avoid cancellation penalty Deluxe Queen: One Queen Bed in the bedroom and separate living room area, with a sofa bed. Also includes kitchenette with fridge and microwave. Superior Suites: One bedroom suites with two doubles or queen bed in the bedroom and sofa bed in living area. Also includes oversized Jetted Tub. Premium Suites: One bedroom suites featuring king bed in the bedroom and Sofa Bed in living area. that comes equipped with a kitchenette including fridge and microwave. Also includes oversized Jetted Tub. The Deluxe Queen and Suites each have refrigerators and microwaves, HD flat screen TV and high-speed internet. The hotel also has an outdoor swimming pool, hot tub and health club. Complimentary parking is available for all registered guests. 13% additional tax will apply. Deluxe Double: Two Double Beds or One King Bed, mini-fridge and in-room safe. windows for city and mountain views, mini-fridge and in-room safe. dinnerware and a second TV. Outdoor swimming pool, tennis courts, all-purpose fitness centre and Eucalyptus scented steam room and tennis court. Complimentary internet service, 15 minute massage (by appointment), parking and shuttle service to SFU are available for all registered guests. Specify SFUCAP before April 17th to enable the following rates. Sylvia Hotel Restaurant: Breakfast from 7:00am – 11:30am, All-Day Menu from 11:30am – 9:30pm, Brunch (Saturday and Sunday Only) 11:00am – 2:00pm.